Like most fasters, I fast from all food during the Clean Water Fast and from all caffeinated drinks (which for me is much harder than food). I only drank tap water. 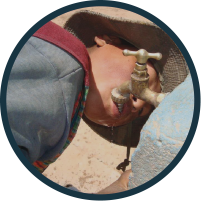 But as I drank it, I realized that our goal for those in Bolivia was to bring them UP TO US TAP WATER. That Tap water, by US standards, was THE luxury we were striving for. They drink river water: brown, dirt floating around, making you and their children sick. So, for the last few years, when I fast I drink my (safe) simulated ‘River water’. It’s pretty simple: take tap water, add brown food coloring to make it look — uninviting. Add pepper to simulate dirt — a lot of pepper. It looks and it smells BAD. The only thing I didn’t add was ExLax! I put it in a clear plastic bottle and carry it with me everywhere during the fast. 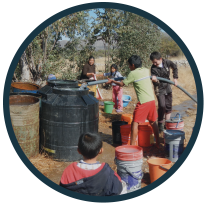 It drove my thoughts back to those whom we want to help; those without clean water. Imagine drinking because it is medicine, not because it quenches your thirst. Imagine working all day digging potatoes or watching sheep and not enjoy drinking anything, not even water. I simply can’t imagine that! Every time I fast and I drink my little bottle of foul-tasting, foul-looking water, I learn something. My understanding and my empathy grows towards those who drink unsafe brown water, not for 36 hours, but every day. And I grow closer to God, experiencing, in a small way, the suffering He experiences everyday through His presence in those who are desperately poor.